Growing up as the only vegetarian in a big family of omnivores was pretty rough. Most of my holiday meals involved a plateful of sides, appetizers, or worse, hanging in there until after dinner and making a meal of dessert. My family has changed quite a bit since those days, and so have I. For one thing, I learned to cook, which means I’ve always got a dish in hand and will never go hungry again at a family gathering. For another thing, my diet has narrowed even more, so now in addition to being meatless, dairy is almost completely out as well. Fortunately, my family lately seems to be moving in the same direction. My parents are slowly cutting back on meat, my husband’s diet is pretty much in line with mine, and I’ve got a brother and sister-in-law working towards veganism. I never would’ve seen this coming, but I couldn’t be more gratified, and not just because it makes it’s easier for me to actually eat something at holiday gatherings, but also because now I’ve finally got other people to cook for. I’m happy to say that everyone seems impressed with my vegan creations. Anything involving cashews is always a sure bet when I’m aiming to impress, so this year it’s going to be a big old vegan cashew cheeseball. This particular vegan cheeseball is actually a vegan adaptation of one I ate a bunch of times growing up. The base is made with blended raw cashews, which make a great vegan cheese on their own, but when you add in some dried cranberries you get the perfect sweet-tart and creamy mixture that you’d never guess was vegan. Adding a bit of oil to the blend gives the cheese a smooth texture. For this recipe I went with coconut oil, which solidifies when chilled, so after a few hours in the fridge your vegan cheese mixture is easily shapeable and perfect for rolling into a ball. You can’t have a cheeseball without some kind of coating, so the last thing I did was roll it in a mixture of pecans and cranberries. The pecans give it the perfect crunch, while the cranberries add just a touch more sweetness and zing. Whatever you’ve got planned for ringing in the New Year, and whoever you’ll be spending time with, I’d bring one of these along. Vegan, vegetarian, or whatever, I think this would be a hit with just about anyone. 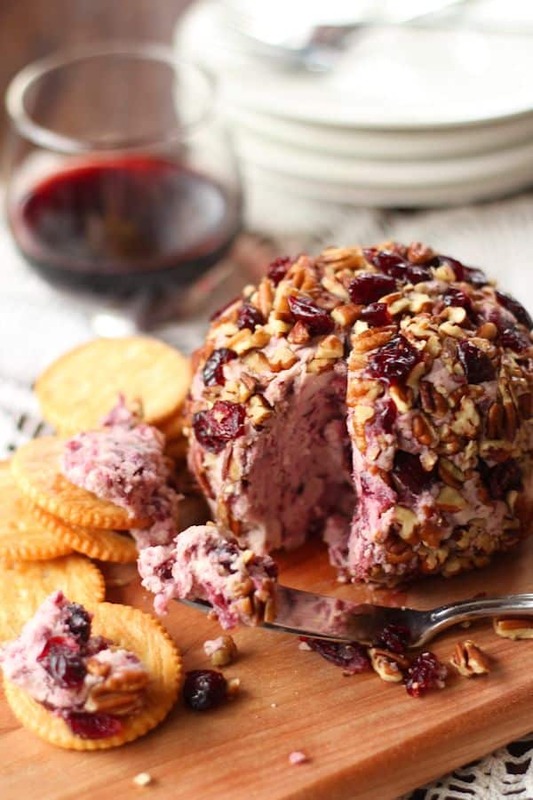 This holiday-perfect vegan cheeseball is made with a blend of creamy cashew cheese and sweet tart dried cranberries, all coated in a cranberry pecan crust. 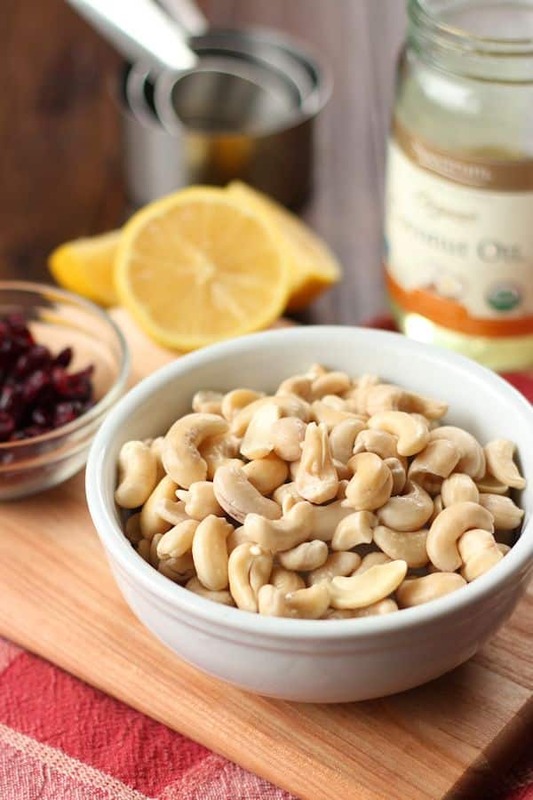 Place the cashews, coconut oil, lemon juice, water and salt into the bowl of a food processor fitted with an S-blade. Blend until smooth, stopping to scrape down sides of bowl as needed. Add 3/4 cup dried cranberries. Process just until cranberries are finely chopped and incorporated into the mixture. This should take about 15 to 30 seconds, depending on your food processor. Transfer the cashew mixture to a sealed container and refrigerate 3 to 4 hours, until it’s firm enough to shape. Stir the pecans and remaining 1/4 cup of cranberries together in a small bowl. Remove the cashew mixture from the refrigerator and use your hands to shape it into a ball. Press the pecans and cranberries into the surface of your cheeseball, rolling it in the mixture if you’d like. Transfer the finished cheeseball to a serving plate and serve immediately, or place in an airtight container and chill until ready to serve. Prep time includes chill time and soak time for the cashews. First, I’m sure this is absolutely delicious. But second, it’s absolutely gorgeous! I’d love to put this out on the table at a party or dinner. You have a great site! I enjoy reading your recipes and look forward to trying them, esp. as my New Year’s resolution is to act on my healthy interests. Re: This recipe … I do not have a processor. Would using a blender give acceptable results? Thanks very much, and Happy New Year. ~ D.
Thanks Dee! I think so. I’ve made similar recipes using a blender, and it sometimes requires a bit more time and stopping to scrape down the sides, but it generally works out. Hope you enjoy and Happy New Year to you too!! I’m putting this on my list for parties with vegan & gluten-free friends. I’d eat it, too! Question, can you use something other than coconut oil? I made some dessert bars with coconut oil and it didn’t agree with my digestion. I assume it was the coconut oil since it was the only thing in the recipe that I don’t normally eat. Thanks. I love your blog. I made the vegan cheese ball and it was delicious. only change I did was use smoked almonds crushed on the outside with the cranberries. I will definitely make this again. Awesome! Glad to hear it. Thanks Scott! Looks great and based on reviews is obviously delicious. My plan is to serve it without mentioning that it’s vegan, unless someone asks. How far in advance could one make and keep this chilled and still taste its best? You can keep it in the refrigerator for about 5 days. You could also seal it up nicely and freeze it for much longer – I’m guessing up to three months or so. I hope everyone enjoys it! This looks delicious. Do you use refined coconut oil or regular? I usually always use regular but am wondering if it will add too much of a coconut flavour. Thank you! I used unrefined and I didn’t mind the coconut taste — it was pretty subtle. If you’re serving it to anyone who particularly dislikes coconut, then you might want to go with refined.